Track time the way you want. 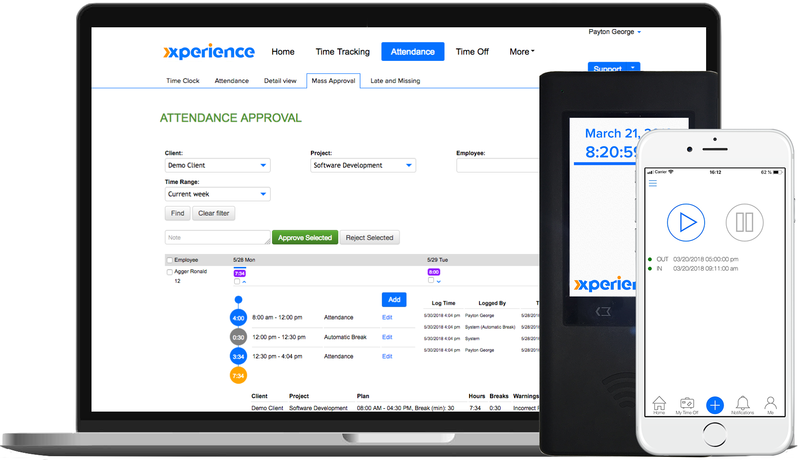 The entire world of tracking employees’ hours revolve around Time Tracking and Attendance. In XperienceHR, you can choose the first, the second or both ways in many combinations, according to your needs. Let your employees clock-in and -out using time clocks, mobile app, web app, wifi or even all of them. 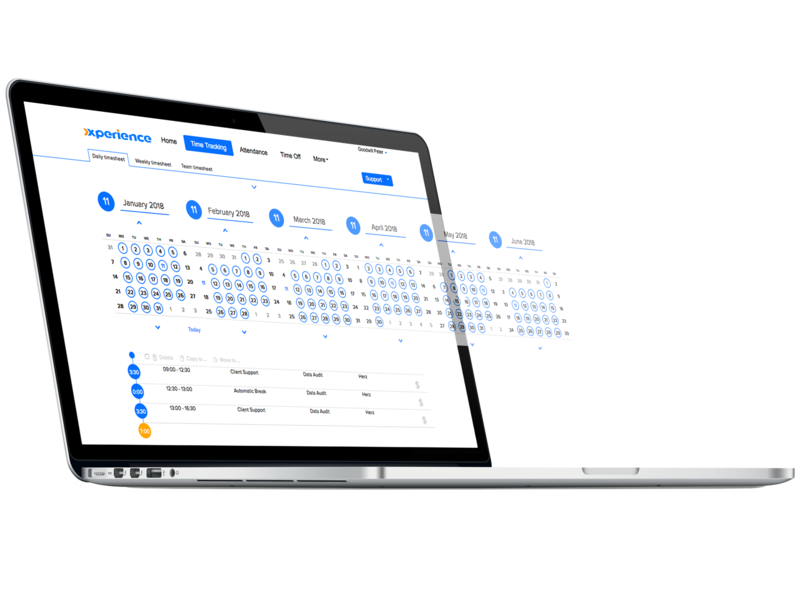 Track time using Daily, Weekly, Team Timesheets or let Exception-based Time Tracking do it for you. All of those available in Chronological or Duration modes. XperienceHR gives you many options, so that it is you who says “what” and “how”. Attendance, as simple as it is, makes no difference. Choose between the Time Clocks, mobile app, web app or let your employees decide by choosing any combination of the methods mentioned. Whatever fits your company best. And even though tracking Attendance truly is simple from employees’ perspective, it is a whole different story on managers’ level. Scanning through tons of data with an art of precision takes a lot of time and effort. 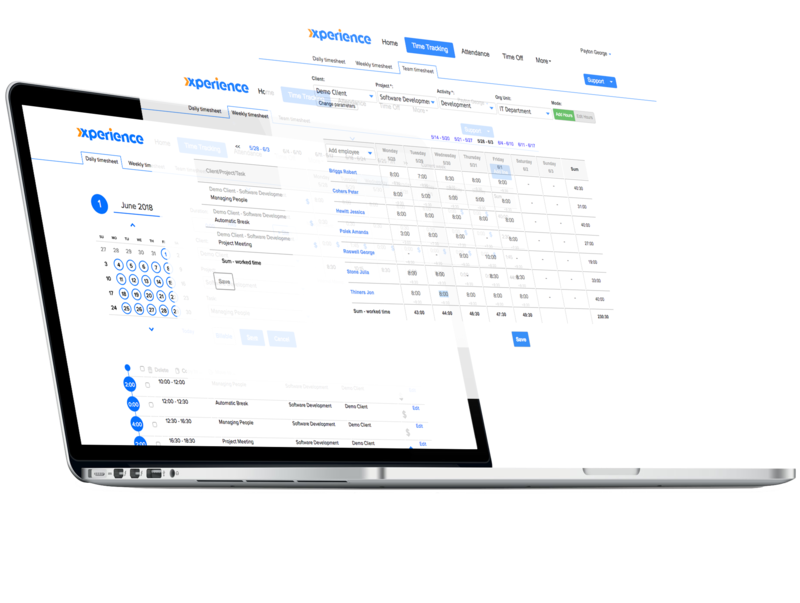 That is why XperienceHR offers features with detailed overviews like Mass Approval, Detail View and others. 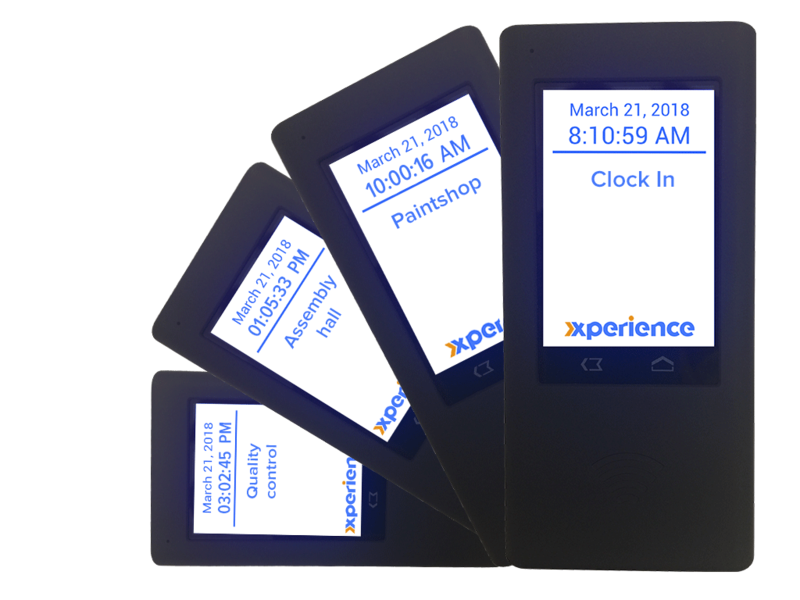 Whether you need to track your activities and tasks day by day, week by week or you want it to be done fully automatically, XperienceHR has you covered. Our daily and weekly Timesheets are now accompanied by Team Timesheet which allows you to track time for your entire team. If you feel like tracking same tasks to same projects takes too much of your employees’ time, then Exception-based Time Tracking is the solution for your company. On top of that, every method of Time Tracking in XperienceHR comes in two options: Chronological using start/stop button for the exact timing and Duration simply indicating the number of hours. The choice is yours. Every minute matters. Transform information into progress of your company by using XperienceHR Clock-In/-Out combined with the Time Tracking. This option combines Attendance and Time Tracking and is aimed at precision and efficiency. It will let you know when exactly the employee clocks-in, starts working on a particular task or when the employee leaves. Information like employee utilization rate, billable hours or project profitability is at your disposal whenever you may need it. Additionally employing independent contractors does not threaten precision of your Reports thanks to External Button, which allows your employees to tag their tasks as external if done outside their workplace or working hours. The future of Time Tracking is here. Fully automatic Time Tracking method which relieves your employees from burden of tracking their hours. 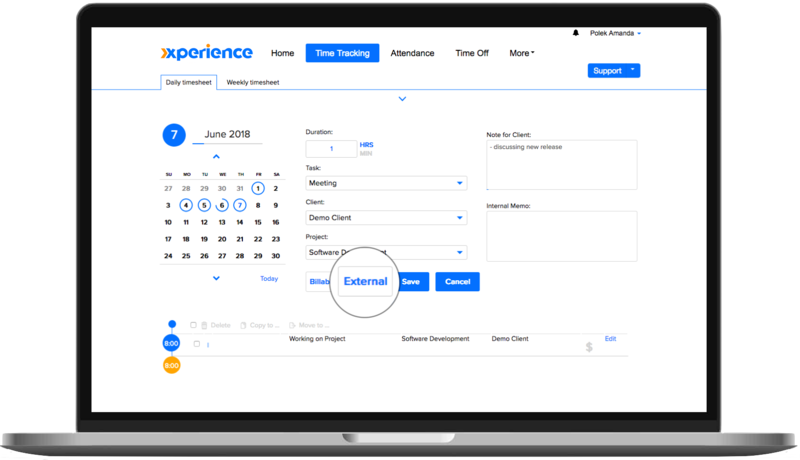 XperienceHR allows you to create custom Work Calendars so that Exception-based Time Tracking will work even for employees with irregular work schedule. Fully Automatic Exception-based Time Tracking and Time Off Management. This option automatically generates worked hours which are not editable. Absences are submitted by employees to make up for hours not worked. Exception-based Time Tracking with Manual Overtime Tracking and Time Off Management. This option automatically generates worked hours which are editable. To achieve precision in Timesheets, employees are able to edit generated hours or even add more hours. Time Offs are submitted to compensate for hours not worked. Your employees work in an environment incompatible with the computers. They need to switch their workplace during the day according to project needs. You want to track their Attendance as well as the tasks they did during their shift. XperienceHR has a solution. It is called Clock-In/-Out Based Time Tracking and it links Time Tracking and Attendance in such a way that the first Clock-In and the last Clock-Out marks the start and the end of the employees’ shift. Any other Clock In is the start of a new task and every Clock-Out is the end of previously “Clocked-In” task.